This year, 2017, marks the 50th anniversary for the Center for Tectonophysics. The Center for Tectonophysics is an interdisciplinary research group initiated in 1967 for dual purposes: to undertake basic and applied research of both natural and induced rock deformation processes and the broad range of geologic structures formed, and to provide research support, training, and mentoring of graduate students and post-doctoral fellows pursuing advanced studies in the area of tectonophysics. The John W. Handin Laboratory for Experimental Rock Deformation is the centerpiece of the research program and provides a variety of experimental systems allowing study of deformation and transport behavior of rock at physical and chemical states simulating surface to upper mantle conditions. 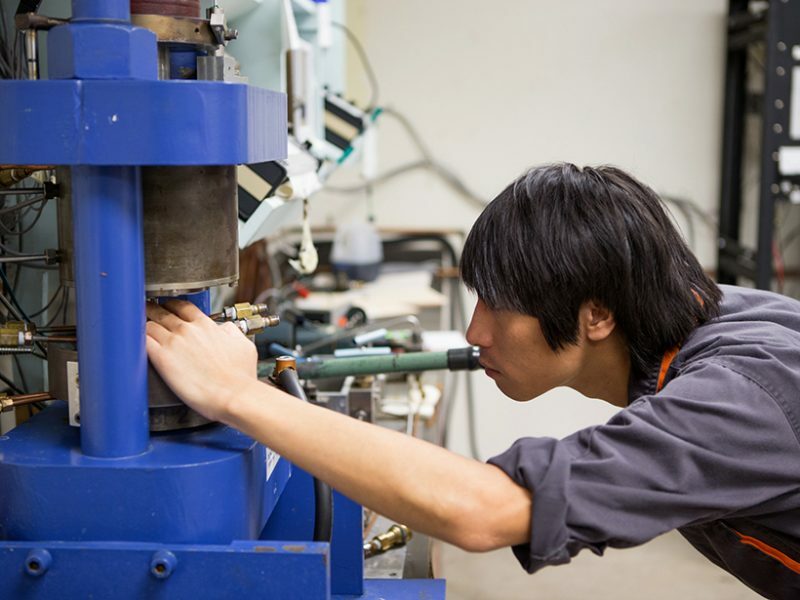 The laboratory is equipped with more than a dozen testing machines to deform rock and measure physical properties, controlled environment chambers, sensors and digital data acquisition systems, a rock repository, sample preparation equipment, and a machine shop. Graduate students, visiting scientists, research scientists, and faculty use the laboratory for research and teaching activities. The Center also manages the Mel Friedman Petrofabrics Laboratory and Sowers Library to support teaching and research activities. The Friedman laboratory is dedicated to the study of deformation textures of naturally and experimentally deformed rocks. experimental facilities for early-career scientists, and promote broader collaboration across the geosciences and engineering. Click here to read more about their efforts towards a national facility. Reference: Kronenberg, A., G. Hirth, N. Lapusta, J. Chester, A. Freed, C. Marone, and T. Tullis (2016), Laboratory sharing to improve rock deformation research, Eos, 97, doi:10.1029/2016EO063465. Published on 29 November 2016.